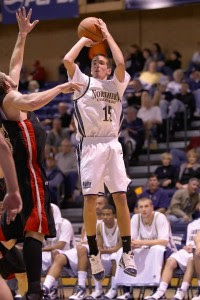 When Devon Beitzel graduated, Northern Colorado lost their best player, and perhaps the best shooter in the Big Sky Conference. While he will have to replaced by a hodge podge of guys (no one player is going to match his production from last season), but one of the guys that looks like he could be a leading scorer for the Bears is Tate Unruh. As a redshirt freshman last season, Unruh played in 17.3% of the team's minutes, but he was very effective in that time. Unruh was 8/16 from 2-point range, and 13/31 from downtown. He is a great shooter - in high school he finished his career fourth as Missouri's all-time leading 3-point shooter (46%) and 2nd best FT shooter (87%). He does need to add some strength. He is 6'4'', 170 pounds and still growing into his frame. A quote from BJ Hill from last season said he had grown 5 inches in the past year and a half, so it is not surprising that he is wiry at this point. If he adds strength, it will make him all the more dangerous. He could also improve his ballhandling and ability to get to the basket, as that would give him even more room to maneuver on the outside. With the loss of last year's Big Sky Conference POY, there is room in Greeley for someone to step up and take command of the team, and become the leading scorer on the team. Don't be surprised if Tate Unruh is one of the best offensive players in the Conference by the end of the season. He has the pedigree and skills, and by all accounts he has the work ethic to get the job done. If he can make the leap from his freshman to sophomore year, UNC will be sitting pretty heading into the Post-Beitzel Era.